We know there are no good losses or moral victories in ThibsWorld. So Sunday’s 105-93 Miami Heat win over Chicago went down as the Bulls’ fourth loss in the last five, dropping them to 43-37 and sixth in the Eastern Conference, one game behind the Atlanta Hawks with two games remaining for each team. But as the Bulls finish their last back to back set of the season Monday in Orlando, they also came away from their final regular season game against the Heat with the sense that of every team in the Eastern Conference, the Heat would most like to avoid the Bulls. Because even with Joakim Noah and Taj Gibson still out along with Derrick Rose, and Richard Hamilton serving a one game suspension; with Jimmy Butler in the circle for the opening jump ball; with the Bulls in foul trouble to start with Miami shooting 15 first quarter free throws in the game after LeBron James complained about the Bulls physical tactics against him; and the Heat playing James, Dwyane Wade and Chris Bosh for the final time this season, perhaps to make sure the Bulls slip to sixth and open the playoffs in the opposite bracket, the Bulls outrebounded Miami with Carlos Boozer getting 16 points and 20 rebounds and mostly stayed within range despite their almost all guard lineup that mostly left the basket unprotected. Much more difficult, obviously, when your fourth quarter lineup includes Nate Robinson the entire quarter and Daequan Cook most of it along with Kirk Hinrich, Butler and Boozer or Luol Deng. That could come Monday as both Gibson, who said when he returns it will be with a brace to stabilize his knee, and Noah could give it a try with just two games remaining before the playoffs begin this weekend. Though it seemed reasonably obvious what the Heat was doing Sunday and what the Heat had said—and it’s effect—after that Bulls win in the United Center last month to break Miami’s 27-game winning streak. If three seasons of wonderfully inelegant battles between the teams compete with tears of victory and defeat wasn’t enough, even the mighty James had enough and openly complained the Bulls played too rough. Look, it’s a form of the complaint teams all over the NBA had about the Bulls in the 1990’s because of Michael Jordan: The league was protecting it’s stars, they wanted talent to succeed. Not that any games were manipulated, of course. But you protect the star; so you have to penalize the opposition. It resulted in a taffy pull of a game Sunday, almost slow enough with 72 fouls called along with a pair of technicals (Thibodeau and Bosh) and with the longer TV timeouts and Jeff Van Gundy stream of consciousness rants on national ABC it had the feel of a golf tournament except for the screaming Heat public address announcer. You’d think that was enough power. But it seemed no coincidence after the Heat’s three rarely playing or playing together since that loss that they were all back for at least 30 minutes. They were upset again, Bosh getting a technical foul after objecting to Boozer. Boozer, in a sense, had the seminal play of the game when late in the third quarter he laid a nice shoulder into Wade as the Heat was running out and Wade was ready to toss James a lob for one of their showoff plays. Boozer stopped that and as James prepared to go up Robinson got to him and knocked him out of the way. Wade got two free throws in a curious clear path call, which is supposed to be when there is a breakaway and you foul from behind. 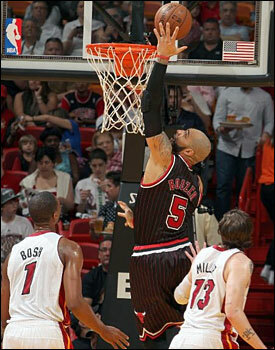 But Boozer was in front of Wade. Later in the fourth quarter with the Bulls making a run again trailing 94-85 after a Boozer three point play with 6:58 left and Hinrich making a steal and getting on a fast break, Bosh grabbed Hinrich in what appeared to be an obvious clear path foul. None was called and the Bulls ended up not scoring and stunting the comeback which never truly came again. “I guess,” Thibodeau said when asked if the early fouls was an officials’ way to set the tone of the game after the last one. “There’s 72 free throws. “I did not,” Thibodeau added curtly when asked if he got an explanation about the clear path calls. He obviously didn’t care to get into this subject even with a big contract extension. “I can’t figure it out,” Thibodeau added with another long pause. And even though Thibodeau had issue with it at times, it’s clearly not a game the Heat like to play. It’s also not a game anyone else in the Eastern Conference plays. And the feeling seemed to be around the Heat that if they have to deal with the Bulls, it’s better to get them in the conference finals, assuming the Bulls can get there, than survive a brutal second round series. Of course, it was hardly the Bulls team the Heat has seen with the Bulls having more fouls calls (30) than field goals made (29) and one off their season high in three point attempts. Deng led with 17 points while Robinson added 14, 10 in the second quarter when the Bulls made a run to get within 56-54 at halftime, and Butler had 13. But no one but Cook shot 50 percent with Robinson five of 16 and Boozer five of 14. Wade added 22 points on seven of 12 like James, though Wade continued his Olympic level of complaining at which he’s become infamous. It’s almost a sequence you call “the Wade” these days when the Bulls tied the game at 58 early in the third. Wade, who often drives out of control, missed going at Deng and stopped to stare, glare and yell at the officials. The Bulls ran down that time and Butler set up for a three. Realizing this, Wade began running back, only to foul Butler after the shot for a four-point play and 58-58 tie. But it is something to watch Miami, whose players often looks like a segment from the View TV program. Late in the second quarter after the Heat had taken their biggest lead of the game at 46-31 as the Bulls clearly were stunted by all the foul calls, James was called for an offensive foul against Boozer with the Bulls coming back with nine straight points after a Robinson three. James acted as if his favorite iPad was stolen. Then as the Miami players waited to come back after the timeout as ABC probably was doing Monday Night Football promos, all five Heat players gathered around the officials to apparently explain the rules and how wronged they had been once again. It’s not like calls went their way afterward as Cook and Robinson added threes to make it a two-point game at halftime. Actually, it suggested how unnerving even the Bulls’ smurfs can be for the Heat players. Look, James is going to be MVP and is one of the strongest and toughest players in the game. But it also suggests they do not like to be disturbed as much as they may protest this hardens them for the task ahead. They are the defending champions and favorites, and it is well deserved. They likely will win again. But you can make it a series with them if you make them pay attention. Still, any series with Miami is a long way off, if at all, for the Bulls. The Bulls, now sixth, are lined up to play the Pacers in round one. Though it is not yet certain. The Hawks hold a one game lead over the Bulls for fifth, but the Bulls have the tiebreaker. Atlanta has Toronto and New York the final day, so if they win both they get No. 5 and Brooklyn. Are the Bulls holding out players and now with Deng down to 35 minutes to stay at No. 6 and play the Pacers, who have lost four of five? Certainly not. Thibodeau doesn’t believe in playing to a matchup. The general consensus has been the Bulls match up best with the Nets, against whom they are 3-1. The Bulls are 1-3 against the Pacers. But there’s also some feeling around the team the Pacers may actually be a better match because their weakest link is their offense, much like the Bulls, and they have been slumping of late while the Nets have played better. Plus, the matchups may be somewhat more favorable against Indiana as the Bulls could use Nazr Mohammed against Roy Hibbert while the Nets play smaller and the Nets have a short bench. Plus, the Nets have higher powered scoring if their backcourt clicks with Deron Williams and Joe Johnson. And there’s less traffic in Indianapolis, which makes it easier for a strong Bulls contingent to travel from Chicago to even the home court crowd noise edge and a bounty of Steak n’ Shake restaurants. The Bulls could all have been playing with braces the way the game was in slow motion to begin with all the foul calls, an obvious message either from the NBA or decision by the game officials to get so called control of the game early. It’s not uncommon in the NBA you’ll see officials call a lot of fouls early if they anticipate issues, though they rocked back and forth with numerous calls, then fewer and then more later. Miami got a 30-22 first quarter lead and was up a dozen early as Mario Chalmers had a strong start attacking the rim with the defensive rotations poor without Noah and Gibson. Deng had 10 points early trying to occupy James, but Boozer and Butler had two early fouls and Mohammed had three in four minutes. James was perfect in the half hitting all six of his shots in a more controlled game. But Andersen, the painted “Birdman,” gave the Bulls problems with his activity and beating players downcourt without Noah. He finished with 15 points and seven rebounds in 15 minutes while Chalmers would only end with 15. Andersen has been a vital pickup for a small Miami team, though the Bulls have handled him much better and in this game was one area Boozer had issues in transition beyond his high level rebounding. 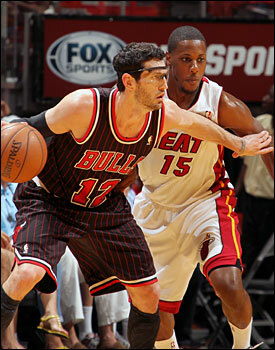 “It was probably one of our better offensive games against Chicago this season, said Heat coach Erik Spoelstra. “Obviously, they’re dealing with a great deal of adversity with guys out of their lineup. We’re still working our habits and so the train goes on. We wanted to log a decent amount of the minutes for the guys. We knew it would be a physical game. A lot of these situations are similar to what we’ll see with (first round opponent) Milwaukee. It was 56-54 Miami at halftime and the game began to accelerate physically for the Bulls, though their shooting remained poor and overall 35.4 percent for the game. The Bulls were within 72-68 midway through the third when Wade got a run going on drives, Boozer hit Wade hard on that lob attempt that led to the free throws, Thibodeau drew a technical foul and needing scoring Thibodeau had to stay with the small guards. Miami led 86-77 going into the fourth quarter with Butler and Hinrich having four fouls each, and the Heat stretched it out quickly with Boozer, Hinrich and Deng off the floor to open the fourth to a 90-77 edge. When your talent doesn’t match the other team’s, you have to play harder and tougher. But when you can’t play that way because of fouls and foul trouble, you better shoot it great. The Bulls couldn’t. The Heat did just enough and when Hinrich didn’t get that clear path call the Bulls didn’t have enough to make another serious run as Miami went to 64-16. It’s historic stuff for them. But the Bulls are looking for one more shot. You get the sense the Heat feels it has seen enough of those guys.